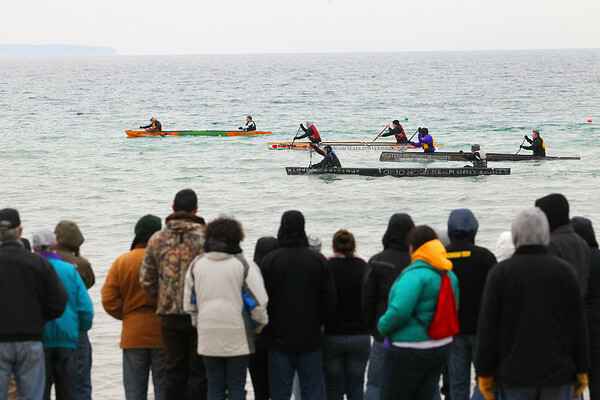 Spectators and team members watch a men's sprint race from Suttons Bay's South Shore Park during Tuesday's concrete canoe races. Over 100 engineering students from nine Michigan and Ohio universities competed in Suttons Bay after ice in Houghton forced a move south. The canoes range in length from 18.5 feet to 22 feet in length and weigh between 150 and 350 pounds. The races, sponsored by the student chapter of the American Society of Civil Engineers, included teams from Detroit Mercy College, Lawrence Technological University in Southfield, Wayne State University, Western Michigan University, Michigan State University, Michigan Technological University, Ohio Northern, University of Michigan and the University of Toledo. The winning team will compete in the 2013 National Concrete Canoe Competition scheduled June 20-22 at the University of Illinois at Urbana-Champaign, Urbana, Ill.